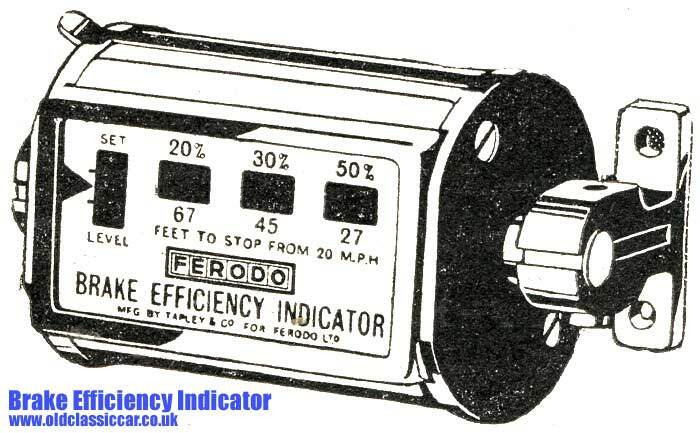 The Tapley/Ferodo Brake Efficiency Indicator. Homepage. This page: A handy gadget for the 1930s' motorist, an on-board brake testing indicator. A permanent in-car brake efficiency meter. Many hands-on motorists even today will have encountered the Tapley brake testing meter, usually mounted in a wooden box and placed in the footwell of a car, to analyse the performance of the car's brakes. At one time they were in regular use in MOT stations, and even now on unusual cars, or those too low to fit on the garage's rollers, the trusty Tapley will be dusted off and pressed into service. 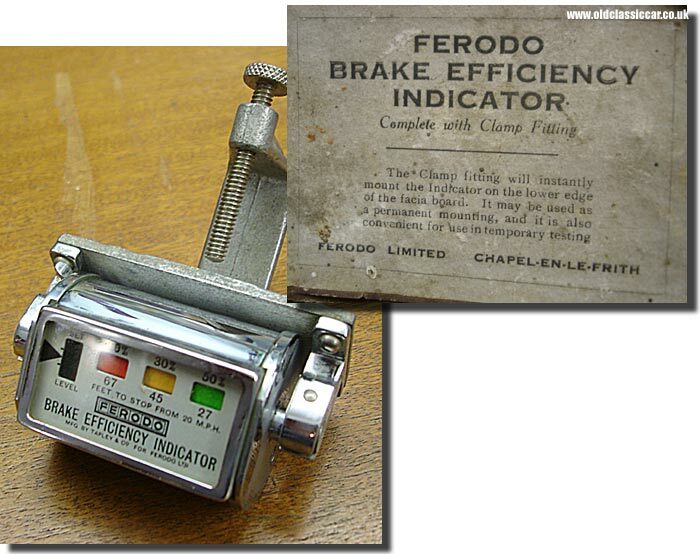 This though, while related to the boxed variety, is a version of the Ferodo (Tapley) "Brake Efficiency Indicator", designed for permanent installation within cars of the 1930s. "The indicator has three small windows which correspond to braking efficiencies of 20, 30 and 50 per cent, and when the brakes are applied a coloured shutter comes into view through one of the windows, thereby registering the braking effort exerted and, additionally, the number of feet required to pull up from a speed of twenty miles per hour. Although only three percentage efficiencies are normally shown, the instrument can be made to indicate intermediate and additional percentages by making a slight adjustment." The unit was designed to be screwed permanently to a car's dashboard (easily done, as in the 1930s many cars still had a dash hewn from a plank of wood). If drilling the dash of your prized motorcar was a step too far, a bracket was available enabling the motorist to hang the unit from beneath the dash. Finished in chromium, it was designed to look the part in any cockpit, and was calibrated at the factory to offer an accuracy of +/- 1.5 per cent. The price was 18s 6d. Whereas the box-mounted Tapley meters are quite common still, I've never seen one of these dash-mounted Brake Efficiency Indicators. If anyone has a photo of such a piece of equipment mounted in a 20s or 30s motorcar, I'd be interested to see it (see below). Other tools in this section include the range of Pickavant brake servicing tools. In January 2013 Ray got in touch, having found this page on the web. At the time he was in the process of advertising just such a machine, and was kind enough to send over a couple of photos of this surviving example. Evidently this brake efficiency meter comes with the bracket to enable its fitment to the lower edge of the facia. Thanks Ray.